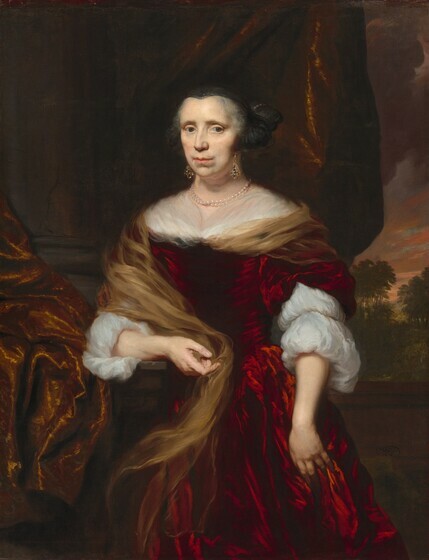 Arthur K. Wheelock Jr., “Nicolaes Maes/Portrait of a Lady/1676,” Dutch Paintings of the Seventeenth Century, NGA Online Editions, https://purl.org/nga/collection/artobject/121137 (accessed April 21, 2019). Nicolaes Maes, one of the foremost portrait painters of the second half of the seventeenth century, began his career as a painter of religious subjects and genre scenes. These early works reflect the influence of Rembrandt van Rijn (1606–1669), with whom he studied in Amsterdam between 1646 and 1653. Maes’ shift to portraiture occurred only after his return to his native city of Dordrecht in late 1653. Adopting the refined style of Anthony van Dyck (1599–1641), Maes soon began to create elegant portraits of Dutch burghers dressed in fashionable clothing that reflected their wealth and status. In search of a greater pool of patrons, he returned to Amsterdam in 1673. Maes has portrayed this unknown matron in a rather formal pose and with a neutral expression, but he softened and enlivened her image with the loose brushwork and vibrant reds of her shimmering gown. The double strand of pearls, emblems of virtue, and her sumptuous earrings proclaim the woman’s prosperity. The broad handling, a hallmark of Maes’ style, owes much to Van Dyck’s manner of painting, but rather than idealizing the sitter as Van Dyck would have done, Maes faithfully renders her countenance. The heavy gold curtain, used as a backdrop, is another reference to material wealth, while the large column and the arcadian landscape in the distance lend the whole scene a classical air. Similar dangling earrings are found in other portraits of the period. See, for example, a portrait of a young woman dated 1670 by Bernart Vollenhove, reproduced in Hans-Joachim Raupp, ed., Portraits (Münster, 1995), 150, no. 57. I would like to thank Marieke de Winkel for her thoughtful comments about the woman’s wardrobe and hairstyle; see correspondence, dated March 11, 2005, in NGA curatorial files. Maes has rendered the dress with remarkably free and flowing brushwork, suggestive of the imaginative nature of his design, and with reddish tonalities that echo the evening sky. Marieke de Winkel, in her correspondence dated March 11, 2005, in NGA curatorial files, notes that this fashion lasted only a few years because it was so uncomfortable to sleep with and gave women headaches. See also Marieke de Winkel, “Historische haartooien,” Kunstschrift 2 (1997): 40–43; see also the hairstyle of Maria van Colve in Maes’ portrait of her and her daughter, 1672, in the Museum Boijmans Van Beuningen, Rotterdam. The timing of Maes’ move from Dordrecht to Amsterdam may also be connected to the void left by the deaths of Amsterdam’s premier portrait painters, Rembrandt van Rijn (Dutch, 1606 - 1669) and Bartholomeus van der Helst (1613–1670). It is possible that this portrait was originally paired with one of the woman’s husband, but the fact that she wears no ring probably indicates that she was unmarried. William W. Robinson, “Nicolaes Maes: Some Observations on His Early Portraits,” in Rembrandt and His Pupils, ed. Görel Cavalli-Björkman (Stockholm, 1993), 112–114. Robinson argues that Maes would have been able to learn Van Dyck’s style of painting in The Hague by viewing portraits by Jan Mijtens (c. 1614–1670) and Adriaen Hanneman (Dutch, c. 1603/1604 - 1671). his recollections ring true with the radical transformation of Maes’ portrait style in the 1660s, from a Rembrandtesque mode to a more elegant and refined portrayal of his sitters, a change that reflected broader cultural patterns in the Netherlands during that period. See, for example, Van Dyck’s Portrait of the Abbé Scaglia, 1634, oil on canvas, National Gallery, London. Maes’ palette is, however, quite distinct from that of Van Dyck. Nowhere in the Flemish artist’s work does one find the brilliant rust-colored reds seen here in the woman’s dress. Maes’ careful rendering of her face also differs from Van Dyck’s more generalized and idealized portrayals of his sitters. In this strict adherence to reality, Maes remained true to his firm roots in Dutch pictorial traditions. Possibly Joseph Guillaume Jean Camberlyn [1783-1861], Brussels. Camberlyn d'Amougies collection, by 1886; Dowager Camberlyn d'Amougies, Pepinghen, near Brussels, by 1897 until at least 1915; her son, Joseph Camberlyn d'Amougies; (sale, Frederik Muller, Amsterdam, 13 July 1926, no. 618, as Portrait de Johanna Koerten, Femme d'Adriaan Blok); De Haan. (sale, Sotheby's, London, 16 November 1960, no. 90a); (Appleby Brothers, Ltd., London). Mrs. Albert Heyse, Ghent; (Heyse sale, M. Dragonetti, Ghent, 13-15 May 1963, 2nd day, no. 345). Joseph F. McCrindle [1923-2008], New York; gift 2001 to NGA. 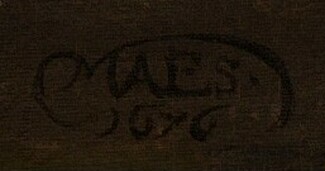 Provenance as given by León Krempel, Stidoem zi dem datoertem Gemälden des Nicolaes Maes (1634-1693), Petersberg, 1999: no. 185. The painting was owned by this collection when it was lent to the 1886 exhibition in Brussels. She was given as the owner by Ernst W. Moes, Iconographia Batava. Beredeneerde Lijst van Geschilderde en Gebeeldhouwde Portretten van Noord-Nederlanders in Vorige Eeuwen, Amsterdam, 1897-1905: 523, no. 4246, and by Hofstede de Groot, Beschreibendes und Kritisches Verzeichnis der Werke der Hervorragendsten Holländischen Maler des XVII. Jahrhunderts, 10 vols., Esslingen am Neckar and Paris, 1907-1928: 6(1915):no. 201. According to the introduction in the sale catalogue, the collection sold in Ghent in 1963 was formed mainly by Albert Heyse, who died in 1955. His widow maintained the collection after his death, and therefore presumably purchased the NGA painting after its appearance in the 1960 sale in London. The 1963 sale was under the direction of Jean Heyse, whose relationship to Mr. and Mrs. Albert Heyse has not been determined. Exposition de tableaux de maîtres anciens organisée au profit de la Caisse centrale des artistes belges, Academie Royale de Belgique, Brussels, 1886, no. 128, as Portrait de Johanna Koerten Blok. First Exhibition of Dutch and Flemish Oil Paintings of the 17th and 18th Century, Appleby Brothers. Ltd., London, 1962, no. 17. The support is a medium-weight, plain-weave fabric. It has been lined and the tacking margins have been removed, but the X-radiographs show faint cusping along all four edges. The current stretcher is approximately ¼ to ½ inch larger than the painted dimensions in the vertical direction, along the top of the painting. This area has been filled and inpainted to integrate it into the composition, though the current frame conceals it. The ground is a red layer of medium thickness. The paint was applied both wet-into-wet and wet-over-dry. The image was created by building up multiple thin layers of paint. Glazes were used to define the shadows and create the sitter’s red dress. Aside from highlights in the sitter’s jewelry and dress, there is almost no impasto. The painting is in fairly good condition. Losses are found in the paint and ground along the bottom edge and a diagonal tear exists in the gold drapery to the left of the sitter’s knee. Maes used a fugitive red lake pigment in the sitter’s face but not in her neck and décolletage. Unfortunately, this pigment has faded, causing the sitter’s face to appear paler than her chest and neck. The painting was treated between 2002 and 2003 at which time discolored varnish and inpaint were removed and a red glaze was applied to the sitter’s face to minimize the color discrepancy and return the painting to its original appearance. This information was obtained through analysis of cross-sections and dispersed pigment samples by the NGA Painting Conservation department in conjunction with the NGA Scientific Research Department (see report dated January 29, 2003, in NGA Conservation department files). Hymans, Henri. "Correspondance de Belgique: L’exposition rétrospective de Bruxelles, II." Gazette des Beaux-Arts 34, no. 5 (1886): 434, as Portrait de Johanna Koerten Blok. Moes, Ernst Wilhelm. Iconographia Batava. 2 vols. Amsterdam, 1897–1905: 1(1897):523, no. 4246. Hofstede de Groot, Cornelis. A Catalogue Raisonné of the Works of the Most Eminent Dutch Painters of the Seventeenth Century. 8 vols. Translated by Edward G. Hawke. London, 1907-1927: 6(1916): 530, no. 201. Hofstede de Groot, Cornelis. Beschreibendes und kritisches Verzeichnis der Werke der hervorragendsten holländischen Maler des XVII. Jahrhunderts. 10 vols. Esslingen and Paris, 1907-1928: 6(1915):no. 201. Bijleveld, W. J. J. C. "Een merkwaardige verzameling oud-Nederlandsche kunst in België." Oud Holland 33 (1915): 161-164. Appleby Brothers Ltd. First exhibition of Dutch and Flemish oil paintings of the 17th and 18th century. Exh. cat. Appleby Brothers Ltd., London, 1962: 34-35, no. 17, repro. Hall, H. van. Portretten van Nederlandse beeldende kunstenaars: repertorium. Amsterdam, 1963: 171-172, no. 1157.1. Krempel, León. Studien zu den datierten Gemälden des Nicolaes Maes (1634-1693). Studien zur internationalen Architektur- und Kunstgeschichte 9. Petersburg, 2000: no. A185, fig. 252. Grasselli, Margaret M., and Arthur K. Wheelock, Jr., eds. The McCrindle Gift: A Distinguished Collection of Drawings and Watercolors. Exh. cat. National Gallery of Art. Washington, 2012: 19, repro. 185. I would like to thank Marieke de Winkel for her thoughtful comments about the woman’s wardrobe and hairstyle; see correspondence, dated March 11, 2005, in NGA curatorial files. See Henri Hymans, “Correspondance de Belgique: L’exposition rétrospective de Bruxelles,” Gazette des Beaux-Arts 2 (1886): 434. For Johanna Koerten, including a portrait engraving, see Arnold Houbraken, De groote schouburgh der Nederlandtsche konstschilders en schilderessen, 3 vols. (The Hague, 1753; reprint, Amsterdam, 1976), 3:293–308. The timing of Maes’ move from Dordrecht to Amsterdam may also be connected to the void left by the deaths of Amsterdam’s premier portrait painters, Rembrandt van Rijn (Dutch, 1606 - 1669) and Bartholomeus van der Helst (1613–1670). See, for example, Houbraken’s account of how Maes removed pockmarks from a portrait when the female sitter objected to her appearance. See Arnold Houbraken, De groote schouburgh der Nederlandtsche konstschilders en schilderessen, 3 vols. (The Hague, 1753; reprint, Amsterdam, 1976), 2:276–277. Arnold Houbraken, De groote schouburgh der Nederlandtsche konstschilders en schilderessen, 3 vols. (The Hague, 1753; reprint, Amsterdam, 1976), 2:275. William W. Robinson, “Nicolaes Maes: Some Observations on His Early Portraits,” in Rembrandt and His Pupils, ed. Görel Cavalli-Björkman (Stockholm, 1993), 112–114. Robinson argues that Maes would have been able to learn Van Dyck’s style of painting in The Hague by viewing portraits by Jan Mijtens (c. 1614–1670) and Adriaen Hanneman (Dutch, c. 1603/1604 - 1671). See, for example, Van Dyck’s Portrait of the Abbé Scaglia, 1634, oil on canvas, National Gallery, London.